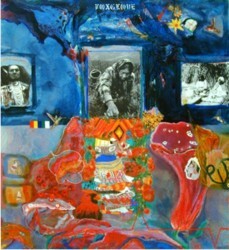 Jane Ash Poitras - a force in the world of Canadian native art. Born in Fort Chipewyan in 1951, Jane Ash Poitras was adopted by a German-Canadian widow because her mother soon died of tuberculosis. Like some others of that generation the adoptive parent didn't understand that it might have been worthwhile for her new daughter to have an opportunity to identify with her native culture. Instead, Jane Ash Poitras became part of the Canadian mainstream graduating with a degree in microbiology from the University of Alberta. But, by the time she was 30 she'd reconnected with her native ancestry and it was a seminal event. It changed her perspective on how she defined herself in the world. At one moment she'd seen herself if not as an outcast, at least as an outsider. When she travelled north to Fort Chip, it was literally a homecoming. The new sense of self called for a new way of self-expression. Jane moved to the United States - completing first a BFA in print and design at Yale University, then an MFA at Columbia University in New York. Eventually returning to her home province, Alberta, Jane Ash Poitras has made her perception of the clash of cultures - native and mainstream - integral to her work as an artist and as a human being. She layers emotive images and words on canvas to direct viewers to pay attention to her point of view.